Fitbit showed off three new activity trackers this week; two fitness bands, the Charge and Charge HR, and one smart fitness watch with built-in GPS, the Surge. I got a hands-on look at the new devices before the launch and it's evident that Fitbit is stepping up its tech game and gearing up to woo athletes away from the competition. 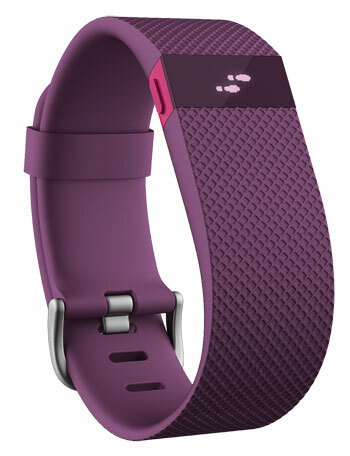 The Fitbit Charge, available now, is the promised replacement for the Fitbit Force that was recalled earlier this year when some users complained of skin irritation and rashes from the band. 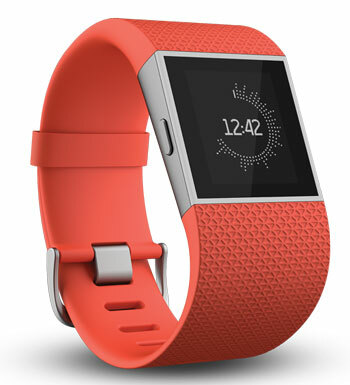 Fitbit calls this new model a reinvented version with not only a better design but more features. The Charge still measures your steps, distance traveled and calories burned, it now also features automatic sleep detection which monitors the length and quality of your sleep based on an analysis of your motion. Additionally, it displays your phone's caller ID on your wrist. You can't actually answer a call or do anything with the information, but it's good to have when you're in the middle of a great workout or other situation and can't grab your phone. All this is shown on a bright OLED display that’s easy to read and scroll through. The band itself is not as smooth as before, it's more textured, but that's ok. It feels comfortable in the hand and on the wrist and didn't seem too heavy. The Charge will last up to seven days before needing to be re-charged, according to the company. Its available now in black, blue, burgundy and slate for $129. Of the three devices I saw, the one I'm most excited about is the Charge HR. It's basically a Charge with a built-in heart rate monitor so you don't need to wear a chest strap during Spin class or a workout. In fact, using Fitbit's own PurePulse technology, it can provide a continuous measure of your heart rate, not just when you press start before beginning a work out, as you must do on other devices. A huge improvement on this device, as well as the Surge below, is the watch-like closure which makes it much easier to put the band on your wrist. Though the notch closures on previous devices have been improved, I continue to struggle to get and keep the band closed on my wrist so I’m happy to see this change. In fact, I’d like to see it on the Charge as well. All this heart rate monitoring on the Charge HR will cost you. It shaves around two days off the battery life, so you'll have to recharge every five days or so. Plus it adds $20 to the cost, making this $150 when it becomes available in early 2015. For serious runners and athletes, or those who like to track their outdoor workouts, the Surge is Fitbit's most advanced tracker yet. It offers all day heart rate and fitness tracking and adds in GPS tracking. The device has eight sensors; accelerometers, gyroscopes, a compass, optical heart rate monitor and an ambient light sensor that all work together to give you a comprehensive summary of your daily activities. 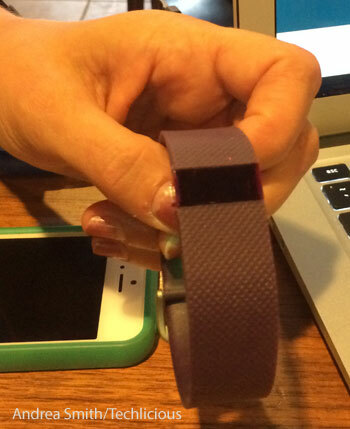 The Surge is so much more than just a serious fitness tracker. It offers smart watch features like Caller ID, text alerts and the ability to control your music from your wrist. I thought this would feel much heavier since the band is a little wider than the one on the Charge and the backlit LCD touchscreen display is larger. I was pleased to find it didn't feel clunky and in fact sits nicely on the wrist. The Surge also has the watch-like clasp. Alas, you'll have to wait a little longer to go for a run with this GPS-enabled smart fitness tracker. The Surge will be available early next year for $250. Does the Charge display seconds when it has the time? Thanks! Yes, there are a few different watch face settings you can change on the Charge and there is an option that shows seconds on the time. Is there any option to fit it into a bra clip or belt clip like previous versions? There are times I want to keep track of my movement but not wear that with a cocktail dress;). Thanks!